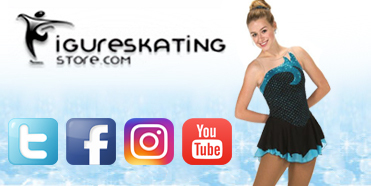 Figure Skating Store or FigureSkatingStore.com is an online retailer of ice skates, ice skating apparel and figure skating dresses. 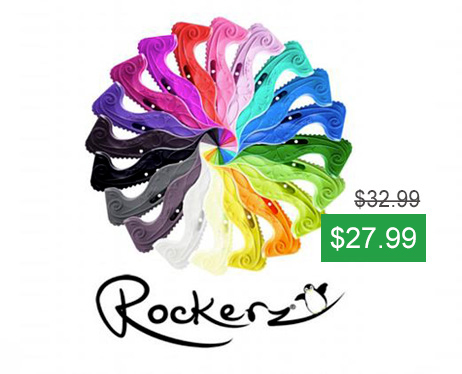 We also carry a large variety of products for dance, ballet, yoga, Pilates and roller skating. Figure Skating is a competitive sport that involves a lot of training and discipline, but it is not just physically demanding, it also requires the figure skaters to be creative and fashionable. Figure Skater's programs are judged on several factors one of which is the presentation which includes the way you look on the ice. We offer a wide variety of figure skating dresses from the world's leading figure skating dress manufacturers. There are many ice skating apparel manufacturers in the ice skating business worldwide, some are small companies with limited ability to supply products and some are bigger with distribution across the continents. 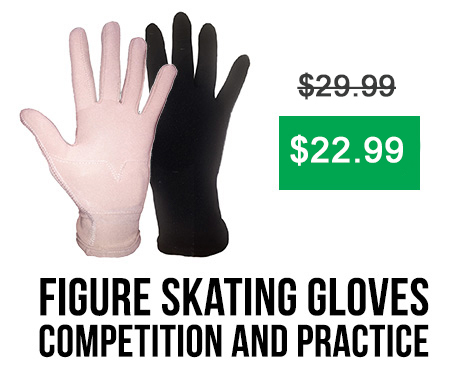 Figure Skating Store strives to bring in both worlds for you. We love supporting small boutique manufacturers which bring you a lot of unique figure skating dresses and figure skating clothing as well as we can't ignore the industry's giants such as ChloeNoel, Jerry's and Mondor. Boutique or Mainstream, ice skating fashion is very important, it helps the skater to bring their performance to life and gives passion to the way they feel on the ice. Which Brand of Ice Skates Should I pick? In the world of ice skates three companies are the leaders, this is Riedell, Jackson and Edea each boasting their own top level skates. Edea has the Ice Fly and soon Edea Piano. These figure skates are considered to be some of the lightest skates in the world and they are also very beautiful using rhinestones for decoration. 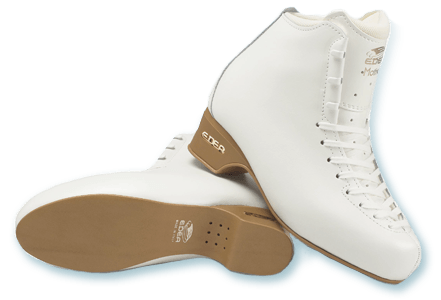 Edea also offers Edea Chorus and Edea Concerto as their runner up advanced skates. Jackson has the Elite Plus as their top level skates. These ice skates are very sturdy and light and they will provide enough support when it's needed most. Jackson is the only company to offer a pair of high end skates with a pair of blades that has a cross cut toe pick, I'm talking about Jackson Competitor. Riedell's Aria uses Kangaroo leather which is incredibly soft and luxurious. 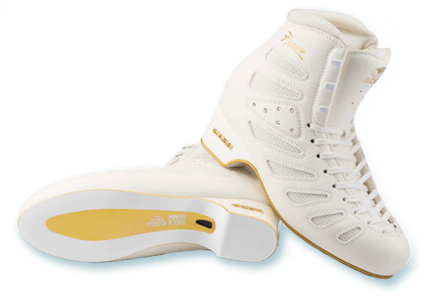 Riedell Aria uses some of the best technologies designed for ice skates. 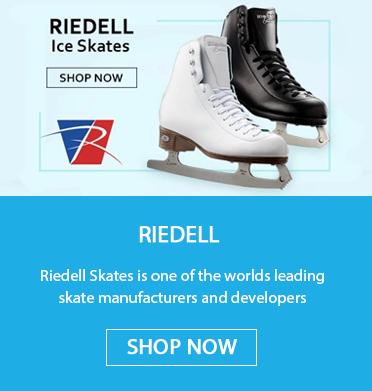 Riedell Skates along with Jackson Skates share 80% of the US market for total ice skates sales, while other companies such as Edea, Graf and GAM share the other 20%. Edea however has the most top level skaters that placed in the Olympics and the World Championships. 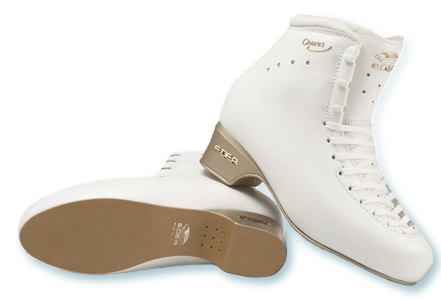 Edea Ice Fly as well as Edea Concerto are worn by several Olympians that took the podium. 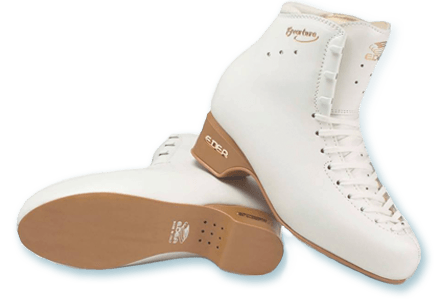 Our Instructional Ice Skates and Recreational Ice Skates Selection is manufactured by the following figure skates manufacturers: Riedell Skates, Jackson Skates, Edea Skates, Graf Skates and GAM Skates. Which Skates Should I Choose? 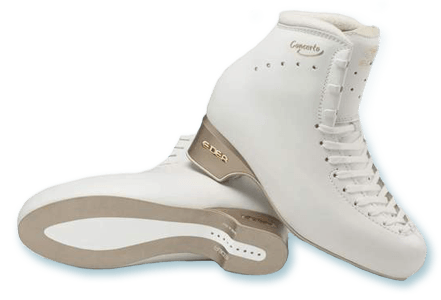 There are beginner ice skates such as Jackson Mystique JS1490 or Riedell 10 Opal, these skates should be used by entry level skaters and are mostly used as a starting pair of skates in learn to skate programs. Skates such as Jackson Softec (various models) and Riedell 113 Sparkle or Riedell 615 and 625 Soar and usually used by recreational skaters who wish to skate as leisure activity or as some people say skate for fun. Then there are Intermediate skates such as Jackson Premiere, Jackson Freestyle, Jackson Competitor and Riedell 25 or 255. These ice skates are used by skaters learning their single rotation jumps and spins. 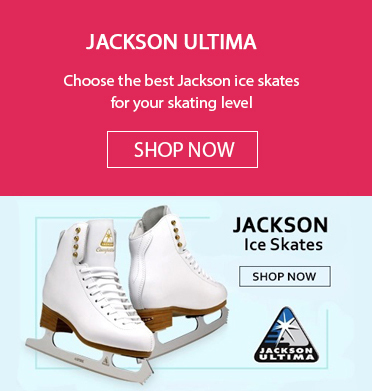 Finally there are advanced ice skates such as Jackson Elite, Edea Ice Fly, Graf Edmonton Special, and Riedell Aria. These skates are used by top level skaters who do double triple and even quadruple jumps and high level spins. Ice skates are the most important part of a figure skaters' attire. 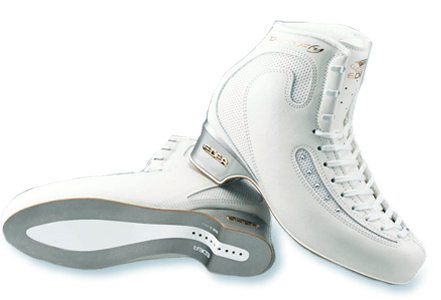 Ice skates come in different stiffness and weight and need to be fitted according to the skater's level and ability. It is very important to select the right pair of ice skates, because if the ice skates are too advanced for your level they will impair your ability to learn and will create more difficulty during the learning process then help you achieve your goals faster. Picking figure skates that are too low for your level is also a bad idea. They will not provide enough support during the various skating elements you might perform. Ice skating dresses are a very important part of a figure skater's attire. Different musical programs have a certain theme to them and of course the outfit should fit with the music. Different Figure Skating Dresses manufacturers produce their figure skating dresses to reflect the tone of various types of music. For example black figure skating dresses and red figure skating dresses are great for classical music, Spanish dresses are great for music like Carmen. Blue Figure Skating Dresses and Purple Figure Skating Dresses are great for romantic melodies. A necessity to all ice skaters. Skate guards are used to protect figure skating blades from damage which can happen if you walk on a hard surface or if you step on something other than a rubber floor mat. Ice Skates Soakers are used to absorb the moisture and to protect the blade from the elements, they help to reduce or completely remove the corrosion. Every skater has to carry their gear somewhere so we carry a wide variety of bags for every taste. Small ice skating bags or big we got them all. For the most part the bag that stands out the most is the Zuca Bag, Zuca is a company based out of Milpitas, CA. It was originally designed by a mom who did want her kid to carry so many heavy books in school and as we may know the books in school are extremely heavy nowadays. Zuca bags are made of two parts - the frame and the insert. Zuca Inserts come in a plethora of different colors and designs, over a hundred Zuca Insert designs to be precise can be found in our Figure Skating Store. The frame is what makes the Zuca Bag an incredible piece of luggage. Zuca frame can support up to 300 lbs. of weight and is made from aircraft grade aluminum to be as light as possible for a metal bag. Zuca bags have a telescoping handle and 4 wheels. Two of the wheels light up by a small dynamo located inside of the wheels. It generates electricity and produces a light when the bag is rolling. The frame comes in seven different colors and can be combined with any Zuca Sport Insert to make up an enormous amount of possible combinations. You can be as creative with your Zuca bag as you want, the possibilities are endless.